The holy virgin Nina was from Cappadocia. According to some, her father Zabulon was a friend of the holy Great Martyr George, whose father was a Cappadocian. The conversion of Georgia by Saint Nina is reported in the Church histories of Rufinus, Socrates, Sozomen, and Theodoret: Rufinus, writing less than a hundred years after Saint Nina, said that he heard the history in Jerusalem from a Georgian Prince named Bacurius. Saint Nina was taken captive by the Georgians (whom the Greek accounts call Iberians), and while in captivity she lived a very devout life of sobriety and virtue, praying unceasingly night and day; this drew the attention of the Georgians, and to all who asked her about her way of life, she preached the dispensation of Christ. When she healed by her prayer a certain woman's sick child, whom no one else had been able to help, the report of her came to the ears of the Queen of Georgia, who was herself gravely afflicted with an incurable malady. She asked that the captive women be brought to her, but Saint Nina declined out of modesty, so the Queen commanded them to carry her to Nina. Saint Nina healed her immediately, and the Queen returned home in joy. When she extolled Nina and her faith to the king, he gave her no heed, although she mentioned it to him often. But while hunting in the forest, he was shrouded with an impenetrable darkness in which he lost his way, became separated from his men, and fell into despair; he made a vow that if Christ should deliver him, he would worship him alone. The light of day straightway shone again, and the king fulfilled his vow. He and the Queen were instructed in the Faith by Saint Nina, and they with the whole Georgian nation became Christ's. The King also sent an embassy to Saint Constantine the Great, informing him of their conversion, and requesting that priests be sent to Georgia. Saint Nina reposed in peace in about the year 335. The above-mentioned Church historians speak of her without calling her Nina. She is celebrated in the Roman Martyrology on December 15 under the name Christina. Because of the Apodosis of the Feast of Holy Theophany also on the 14th of January, the liturgical services to Saint Nina are transferred to January 13th. O come ye all today and let us sing praise to the chosen one of Christ, the equal of the Apostles, the preacher of God's word, the wise bearer of good tidings, who hath brought the people of Kartalina to the path of life and truth; she is the disciple of the Mother of God, our zealous intercessor and unwearying guardian, the most praised Nina. 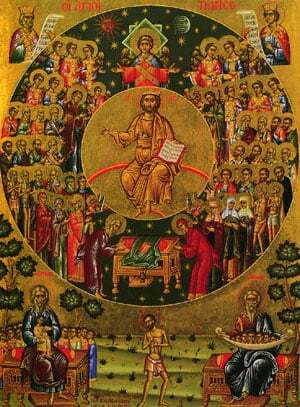 Share the feast of Nina of Georgia with an icon greeting ecard.